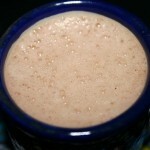 Hot chocolate is perfect for cold winter nights, but why not try a different take on it and try Mexican hot chocolatae! When you taste and inhale the scent of rich Mexican Chocolate, your senses will immediately react to the distinct flavors of cinnamon and spice. This is what separates it from the rest of the types of chocolate out there and in my opinion is the best chocolate! Mexican Chocolate can be found in grocery stores in the baking or international aisle. It is usually sold in bar and disc form, but it can be found in powders and syrups. Here is a little bit of history on Mexican chocolate. The cocoa plant was discovered by the Mayan civilization in 200-900 A.D. Rich and poor consumed it primarily as a beverage. With the rise of the Aztec culture, cocoa beans became a precious commodity reserved for the wealthy and often used as currency. In the 1500’s the Spanish Conquistadors introduced the cocoa bean to the rest of the world and the love affair with chocolate continues today.